*On Wednesday evening, a Twitter account claiming to be run by a breaking news expert in Tennessee posted a somewhat plausible and want-it-to-be-true item about Colgate freshman standout Jordan Burns allegedly missing the team flight to Columbus, Ohio for Friday’s NCAA first round game against Tennessee and deciding to hop in an Uber for a 500-mile drive to join his team. The tweet from @RGW_News was viral enough (more than 2,000 retweets and 14,000 likes as of Friday morning) that I remember seeing it Wednesday night as I browsed my timeline even though I certainly don’t follow that account. It piqued my curiosity because it sounded like a great story, but also because it sounded a little fishy. An Uber? And the team didn’t notice it left its second-leading scorer (15.8 ppg) behind? I couldn’t find any other outlets reporting the story upon a quick search. I stopped investigating and just let it go, deciding I wouldn’t make any mention of it unless there was more corroboration. Turns out the story was completely fake, which isn’t a surprise but does offer social media cautionary tale No. 589,430 about not believing everything you read. 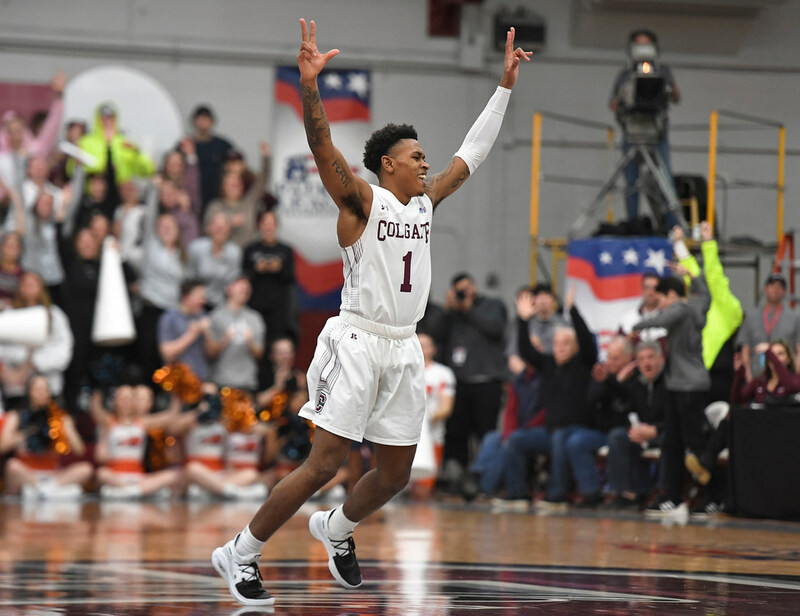 Colgate guard Jordan Burns was in Ohio on Wednesday just as he was supposed to be. Then his mom called. Burns soon found out the reasoning. A fake tweet circulated rapidly on Twitter late Wednesday saying the Raiders guard missed the team flight and had to take an Uber to Columbus to join his team. Even worse? The original tweet is still up, and the account is still humming along. If you scroll through it, you see several more tweets that are somewhere between “kind of plausible” and “almost definitely not true” but there’s no attempt at all to brand it as satire. It’s the very definition of fake news. *I’ll do more on this later, but Sean Tierney made a bunch of fascinating NHL visual charts that basically tell us (or want us to believe) that the Wild has been incredibly unlucky this season. Basically there’s a huge negative variance between the number of goals the Wild is expected to score/allow and the number it actually has scored/allowed. *The Wolves are 10 games out of the final Western Conference playoff spot with 10 games to play. Their next loss, which could come as soon as Saturday at Memphis, will officially eliminate them from the playoff race. Thursday’s loss at Charlotte put the Wolves into the 11th spot in the lottery standings, flip-flopping with the Hornets who are now a half-game better than the Wolves in the actual standings. *The Gophers are 8-1 (including 4-1 against major conference teams) when Gabe Kalscheur attempts at least seven three-pointers in a game — as he did Thursday in going 5-for-11 in the NCAA tourney win over Louisville. Keep feeding him, and let it rip. He was 3-for-4 from long distance, by the way, when the Gophers lost 79-55 to Michigan State earlier this year. Lillard's 50 points and a first-round series victory included a long, Game 5-winning three-pointer, then waving good-bye to the Thunder and star guard Russell Westbrook. Paying elite quarterbacks big money is a good idea and translates into wins. Paying comparable money for good but not great QBs is a much bigger risk. It’s gotten so bad that in a recent game the Yankees’ starting nine was completely different from what it was on Opening Day and consisted of a bunch of guys you’ve probably never heard of.